Referee: Michael Oliver‎ | Attended :‬ ? Hull City (2) : J.Chester[4'], M.Figueroa[19']. Man Utd (3) : C.Smalling[19'], W.Rooney[26'], J.Chester(o.g)[66']. McGregor, Bruce, Chester, Davies, Elmohamady, Figueroa, Meyler, Huddlestone, Livermore, Graham, Sagbo. Substitutes : Harper, Rosenior, Faye, McShane, Koren, Boyd, Fryatt. Substitutes : Lindegaard, Vidic, Carrick, Fabio, Kagawa, Januzaj, Hernandez. 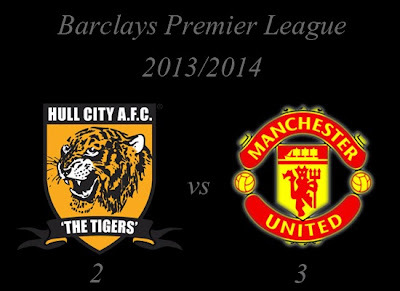 How do you think about Barclays Premier League : Hull City vs Manchester United?